The TCR is a molecular complexe wich comprises two units: a recognition unit, composed of either alpha-beta or gamma-delta heterodimer, which are present on the cell surface in a mutually exclusive manner, and, a transducing unit, the CD3 complex, common to alpha-beta and gamma-delta heterodimers, which triggers the T cell when the recognition unit is occupied by the antigen. The recognition unit recognizes foreign antigens and the diversity necessary for this function of recognition is generated by somatic recombination the TCR genes. There are four TCR gene loci (alpha, beta, gamma and delta). Each of them is composed of several V (variable) segments, coding for about 90 amino acids, very short D (diversity) segments (alpha and delta loci only), and short J (joining) segments (about 15 amino acids), and one or two C (constant) segments. 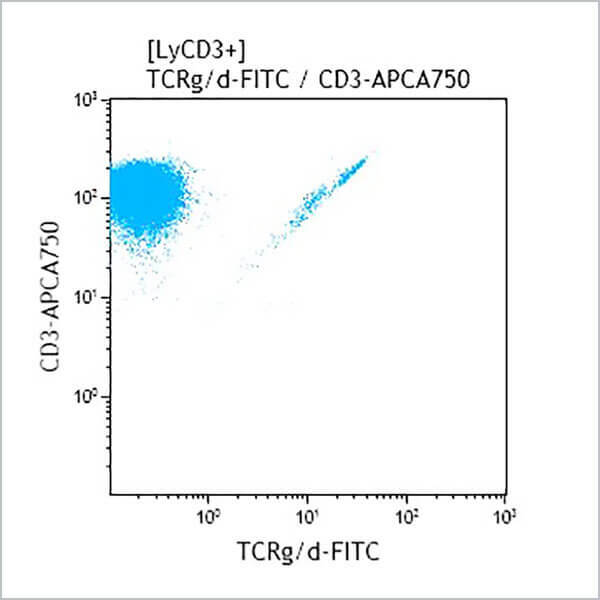 Most of T cells express the alpha/beta TCR (T cell receptor) protein and a small population of T cells expresses the gamma/delta TCR, which usually has a double negative (CD4/CD8) phenotype. Gamma/delta T-cells are normally the first line of defence at epidermal and epithelial surfaces and they represent 10-12% of lymphocytes in the spleen.